That Summer Break, I filled in as rehearsal pianist for the International Conducting Workshop, a conducting course Gustav Meier taught in Mexico. During the lunch breaks I would practice my repertoire, including the Moments Musicaux. Before one of the last sessions, Gustav Meier came up to me and mentioned casually something to the effect of: “I’ve been listening to you practice that Schubert all week. It sounds wonderful.” We then talked briefly about one section that he liked particularly in the second piece of the set, how difficult it is to pull off the pick-up notes of the sixth piece, and our favorite recordings. After that minute-long conversation I was glowing. I played through the opening of Beethoven’s Fifth for the next couple of hours with the conducting students with a renewed energy. A weight had been lifted. The next day, when I sat at the piano to practice those pieces, I broke down weeping and shaking uncontrollably. I did not return to Spain in the fall. I played the Moments Musicaux in a recital later that year and put them away until now, almost eight years later. Maestro Meier passed away this week. We did not stay in contact after that, although I played piano for his conducting workshop the next year and ran into him once while living in Michigan. Although the gestures and ideas discussed in those workshops have stayed with me and become an important part of my conducting background, I was most affected by that one casual remark. I could have gone back to Spain and continued on the self-destructive path I was on. I was depressed, lonely, alienated from my family, and potentially suicidal. That simple gesture of appreciation changed my life. That ability to reach out and touch another human being so profoundly is, in my opinion, the highest ideal of any conductor. Motivation is one of the trickiest and most important aspects of leading an ensemble. A choir can live or die depending on a conductor’s capacity to maintain the group’s motivation. Different things will demotivate different people, so it can be difficult to pinpoint specific techniques that can be useful in all cases. There’s also a widespread assumption that this aspect of conducting and teaching is entirely dependent on charisma and that it can’t be effectively taught. • Keep a choir motivated. • Create moments of genuine insight that are frequent and personal. This should be your first priority. Surely not everyone will love a particular piece, but they shouldn’t get to a point where they abhor it. Getting a choir to learn a work temporarily is never worth making them hate it permanently. Help your choir get excited by showing them early in the process what excites you about the piece — programming repertoire that doesn’t excite you is always a bad idea. This is usually easy to do, but hard to maintain in the long term; it will usually take several reminders of what makes a piece exciting to you to get a choir on board with your vision. There are probably certain details of the piece that you are crazy about. However, love of the details came from a broader appreciation of a work. Get your choir excited about the big picture: the big picture will help them appreciate the details of the piece, not the other way around. Learning notes, drilling passages, and detailed rehearsing will be more productive and permanent if the big picture is in place. Learning details without context can feel futile, and few things are as effective at promoting hate for a piece of music as rehearsing with a sense of futility. • Find a section of the piece that is approachable and that serves as a microcosm of the entirety of the work. Use that section as an anchor to introduce new sections, going from the known to the unknown. Introduce new concepts gently. This will help maintain their desire to revisit the piece. • Plan for a “moment of insight” in the first few minutes of rehearsal that will encourage them to keep going. This can be an activity, a practice technique that they haven’t done before, or a mind-blowing fact that makes them question an assumption about the piece. The goal is to create a moment of self-satisfaction in the singer where something in the music suddenly makes sense, a moment where it “clicks”. • Make the rehearsal progressive so that even a short time investment results in insight or audible progress. Plan your rehearsal as if some of the musicians had to leave after a few minutes, some halfway through, and only a fraction staying until the end — make sure that all of them “leave” with some kind of insight. It’s easy to forget just how confusing certain aspects of a piece can be in the beginning. It is important to acknowledge this and reassure the group that you’re there to help them figure it out. Failing to acknowledge that things can be confusing or difficult can imply to the group that the fault lies with them. A conductor’s job is not to be omniscient authority. Let’s not expect perfection from our ensembles and ourselves. Rejoicing in the the process of rehearsal and practice is the best way to attain lifelong commitment and continued satisfaction from what we do. College athletes with the sole goal in life of playing in the NFL or the NBA are probably setting themselves up for failure. However, athletes that are prepared to play several sports, coach, train teams, and run sports-related businesses are equipped to succeed in their careers, regardless of the circumstances. Thousands of music students every year enter the best universities and conservatories with a similarly improbable goal in mind: to join one of the top orchestras or to become a famous soloist, yet the odds of attaining a full-time position in a good orchestra or being able to make a career of touring and playing concerts exclusively are astronomical. There is a demand for musicians and music educators in today’s economy. A well-prepared musician can make a decent living and the idea of the “starving artist” is a myth, perpetuated by unrealistic expectations and inadequate preparation. As with any other career, an adequate preparation is essential. It’s not enough to attain a suitable level of skill in performance and teaching abilities but one has to engage in multiple aspects of musical life. I believe that even today, in most institutions, the skills most critical to a successful musical career are grossly neglected, if not outright ignored. Many instrument teachers’ approach can be reduced to “learn this piece and eventually play it very well, then learn a harder piece and eventually play it very well…” repeated from the moment a student enters school until they graduate. They’ll even actively discourage students from getting too involved in other courses lest it take away valuable practice time — especially common with pianists, who don’t have the time in the orchestra to balance out the many hours spent as a shut-in. The result of this teaching approach is a student that can play a handful of works but with no guarantee that the student understands the process involved in learning them. The student can’t communicate the process to others and ultimately will not have the means to find an audience for that handful of works. In the real world, this is close to useless. When I know a student is going to pursue a career in music, it makes an enormous difference in my teaching approach. It becomes my responsibility not only to help those students learn a handful of pieces, but to give them the other necessary tools for a career in music. Most of the time, this results in a greater emphasis on often neglected aspects of a pianist’s education, such as sight-reading and singing, harmonic analysis, improvisation and accompaniment. 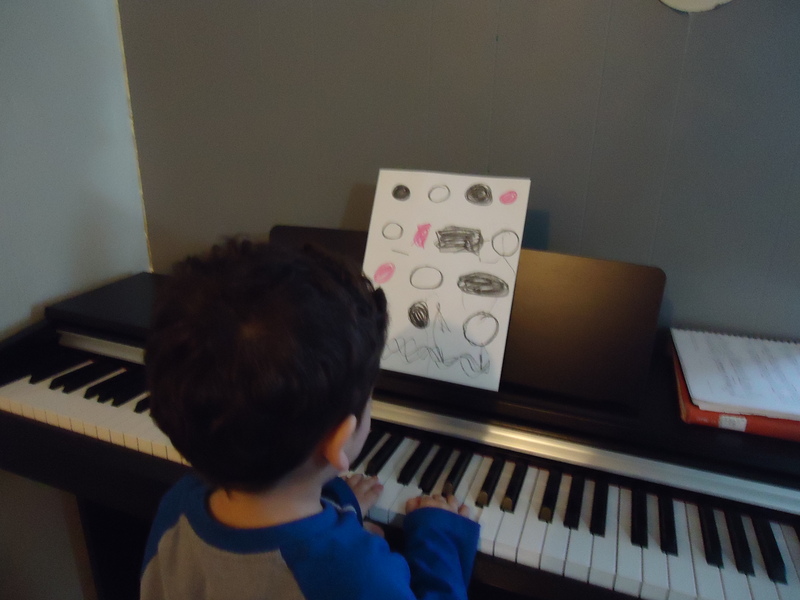 This will necessarily take time away from the “learn a handful of pieces very well by drilling them repeatedly” aspect of traditional piano teaching. I propose that, to build a career in music, musicians should strive to be as diverse in their knowledge as possible. They should be able to read music fluently, improvise, arrange and have at least a functional knowledge of conducting, composition and performance in more than one style; every musician should have at least elementary keyboard abilities and every pianist knowledge of vocal technique. More important than “playing a handful of pieces very well” is learning to learn, so one can pick up any piece of music quickly and perform it confidently on stage — in real life, you seldom get a semester to learn your repertoire. Every musician should be a competent teacher and be familiar with diverse pedagogical methods and the appropriate material for different age groups and types of students. They should be able to work with other people, as part of a team in smaller ensembles or under a director in bigger groups. Musicians should be able to express themselves in writing, speak in front of an audience, and use the Internet, notation software, and recording software competently. My own musical education was of the traditional kind. Although I was lucky to have very good teachers, my instruction was always limited to playing the works I was assigned, and then learning some new ones. I was lucky in one sense: I had to support myself through school. That meant that I played trumpet in several orchestras, salsa bands, mariachi ensembles and on the street; I played piano in a dance studio, pretended to play jazz in restaurants, and accompanied church services; I directed ensembles and taught students of all ages; I had to take every job I could get, regardless of the time I had to learn the music, and adapt for each situation and audience. Looking back, every single one of those experiences has been as useful, if not more, than the handful of pieces I learned in school. I grew up playing the trumpet. For me, trumpet technique is all about perfecting a few, incredibly difficult tasks. Playing a single note perfectly is nearly impossible. Practice was all about slowly chipping away at the mythical “perfect note”, sculpting a beautiful sound or a perfect articulation. 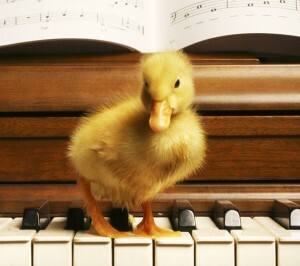 When I started to play piano, I tried to practice this way. Initially, I made very quick progress but soon hit a dead end. My way of practicing just wasn’t working, in some cases it was actually making things worse. That’s because piano technique is not about mastering a handful of incredibly difficult tasks. Unlike the trumpet, playing a note on the piano is the easiest thing in the world. With your eyes closed, a single note will sound the same if played by a cat, a toddler, a dropped object on the keyboard, or Rachmaninoff himself. Piano technique is about coordinating dozens, or even hundreds of extremely simple tasks all occurring at once and one after the other. On the trumpet I’d coordinate three or four very hard actions at one time, but even the simplest piano pieces require juggling a dozen very easy things. That, coupled with the fact that the piano is extremely visual — everything is there, in plain sight! — meant that piano technique required a different approach. Its technique involves breaking a problem down into its simplest components and then putting them back together. It’d be very silly to improve trumpet technique by vibrating one lip and then the other, but in the case of piano technique there are cases where you really need to break down a problem into such absurdly tiny elements. As conducting and singing become a bigger part of my life, I’ve struggled with an entirely different type of technique. In both cases, the “piano” and the “trumpet” approaches have not given me good results. The “trumpet” approach to technique involved learning an incredibly difficult task that I did not know how to do naturally; one learns through self-training, repetition, and exercise. The “piano” approach that best worked for me involved intense analysis of a problem and coordinating many very easy tasks in the most direct way possible; one learns through organization and coordination. The “conducting-singing” approach to technique doesn’t attack technical problems head on, trying to wear them down through exercise or break them down through intense analysis. One learns by realizing that most technique problems come from ourselves, working around them, and having the wisdom to understand that they will go away in due time, as long as we are conscious of the right way of doing things and fixing the things that we can fix at that particular moment. These are not particularly bad ways of approaching life’s problems. Sometimes I’ll come up against a situation where I’ll ask myself: is this a trumpet problem or a piano problem? If there’s one thing that I’ve learned from singing and conducting is that there’s a third option that is equally valid: working around the obstacle and trusting that it’s mostly in my head and will go away if I leave it alone. Playing the piano is easy: you press a key and a note comes out. 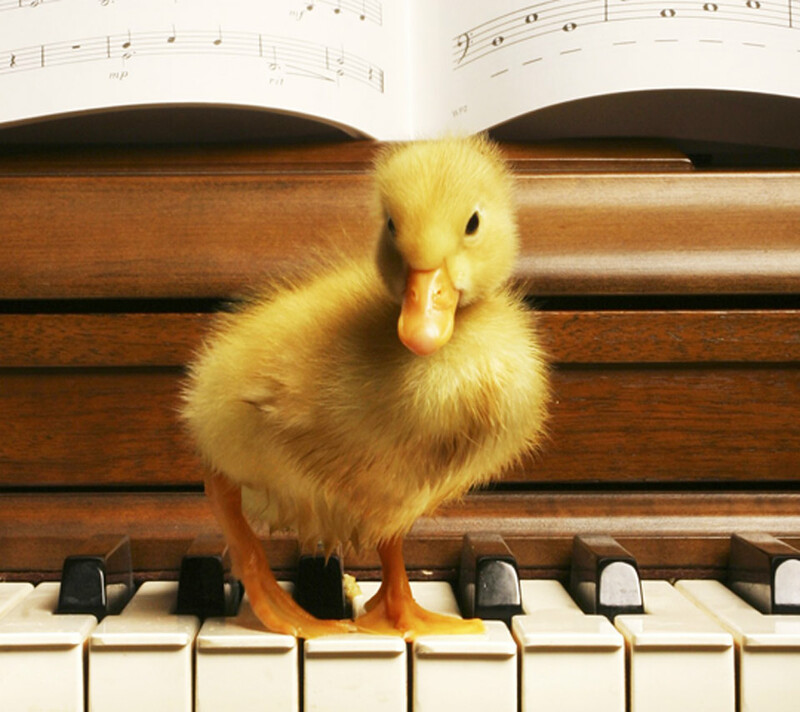 Toddlers can play the piano, cats can play the piano… you can drop a shoe on the keyboard and it will play the piano. This is what makes the piano so universal: anyone can play it immediately. It’s easy to forget that other instruments aren’t as welcoming. Other instruments need pushing, pulling, blowing, and squeezing in order to produce and maintain sound. String players spend weeks learning how to hold their instruments properly and most people can’t get a clean musical note out of a wind instrument on their first try. Anyone, or anything, can play the piano. However, the fact that the piano is easy to play can work against us. For any other instrument, holding a musical note takes effort; there is air or bow movement that must be maintained until the note ends. Pianists can fall into the trap of just hitting the note and forgetting it. After all, you press a key and a note comes out. 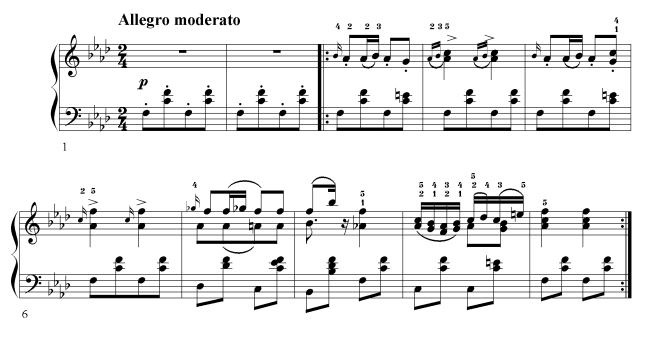 Many piano teachers try to solve this by having students follow through with their arms after pressing a key or pressing down on the keyboard in a kneading motion (one of my teachers called this “chewing on the keys”) — some even recommend shaking the finger on the key in a bizarre imitation of vibrato. While these movements can help, exaggerating them can lead to problems with technique. Furthermore, mechanically none of this makes sense; that is simply not how pianos work. The problem boils down to a bad habit present in many pianists: hearing everything in staccato. When notes don’t require an effort to sustain, our minds can become lazy. We stop following the notes in our minds. We stop singing along with them, leading them and releasing them properly. We end up only listening to the note’s attack, resulting in typewriter pianism. There is no set of movements that can cure hearing everything in staccato. While they can be helpful in teaching children, the goal should be to teach that a piano can sing, that notes don’t stop after you press the key. Often, we mistake this for teaching the movements themselves rather than what they are for. To make the piano sing, the change begins in our heads, not in our hands. You will never make the piano sing if you hear everything in staccato. There are certain musical experiences that stay with you forever. I’ve written about a few of my own before (e.g. my first experience listening to Alicia de Larrocha.) When I first started writing this blog, I wanted it to be an outlet for sharing the things I find fascinating and incredible about music — listening to music, playing music, teaching music, living life as a musician. One of my first posts on this blog, “Brahms as it should be played”, was about a recording that I adore: the Brahms Piano Trios with Janos Starker, Julius Katchen, and Josef Suk. In fact, to say that I adore this recording actually falls short of what I mean; listening to this CD has become something of a physical need. Every few weeks, I find myself needing to listen to it. Every time I listen to these incredible musicians play, I find something new that I love about their playing. Even though I’ve literally listened to this recording hundreds of times, just yesterday I fell in love with a peculiar change in bowing when Starker repeats the first part of the B major Trio; last week I fell in love with the way Josef Suk changes colors constantly in the development of the first movement of the C major Trio, making it seem as if there were a viola playing along with them; just this morning, there was a little glissando in the Scherzo for the second Trio that just blew my mind… The people around me know that I can go on for hours about the things I love in this recording. A few hours ago I read that Josef Suk recently passed away. I was very sad to get these news. To me, he is the violinist. The way this amazing musician played the violin is for me the ideal; he played the violin as it was meant to be played: warm, emotional, extremely rich in color — like a singer, but so much more songful than any singer could ever hope to be. Josef Suk’s excellent recordings of Dvorak, Martinu, and especially this recording of the Brahms Trios, made me fall in love with chamber music and with a particular way of playing that is at the core of what I think music should be. Rest in peace, Josef Suk. I never got to meet the man, or listen to him live. However, every few days I listen to his playing and find something new to love. I’m sure that will still be the case for a long time to come. Last week, we had auditions and selection of new students at our conservatory. This year, I took charge of auditioning all the kids that signed up for piano lessons. I did this because, in the last couple of years, I’ve gradually shifted my focus away from the advanced college students and more towards teaching children. After listening to about thirty kids from the ages of six to eleven, I was struck with the huge variety in personalities, talents, and different strengths and weaknesses. Some kids were extremely outgoing — and oh so loud! — while others were so shy it was impossible to get them to say anything. Some kids had perfect pitch and others could barely sing back a note, or recognize if a note was higher or lower than another. And I knew that, once we started with our lessons, I’d have a bunch who would breeze through the beginners books and pieces. Others would advance slowly, struggling with each step. However, in the long run, none of that is important. I’ve had about four dozen children take lessons with me since I started teaching. My wife is much more focused on teaching kids than me; she’s taught the violin to about twice that number. The other day, we were talking about how children progress when learning a musical instrument. They’re like trees. A teacher can prune, water, and nurture them, but each of them grows in a completely different way. Eventually, each one branches out into new interests and activities which may overtake their interest in the violin, piano, or whatever musical instrument they’re learning. It can be difficult to predict what path they’ll take. Whether, a few years down the line, their musical instrument will still play an important role in their life, or whether they’ll abandon it for something else. Talent, or musical aptitude, is not a good indicator of long term success. That is, if we define talent as having good pitch, rhythm, musical memory, and physical aptitude. Some “talented” kids breeze through the first months of lessons, only to crash against a brick wall when their “talent” isn’t enough to take them farther. A musical background can also be defining, but it isn’t a good indicator of future success either. My wife and I have both taught children with parents that are professional musicians, only to have the kids abandon their musical instruments after a while. Long-term success at any musical instrument is directly related to discipline in practicing. In young children, long-term success is directly related to parental involvement both in lessons and in practicing. Image in this post found here.